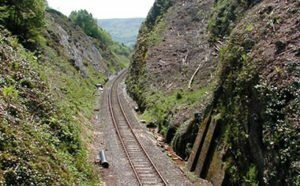 We’ve profiled quite a few ‘big names’ in British engineering history recently, so we thought it was time to take a look at a perhaps less well-known, but still resourceful and influential engineer who was responsible for much of the rail system in Wales and went on to spread his knowledge and inspiration across the globe. Benjamin Piercy was born in Trefeglwys, Wales, in 1827, and in his 61 years he was involved in almost every new railway development across the country and eventually became Chairman of the Institution of Civil Engineers and a Justice of the Peace. He was known for his technical acumen and gift for persuasion, promoting the cause of Welsh railways in parliament while developing the Talerddig cutting (pictured below, at the time the deepest of its kind in the world), the bridges over the Severn estuary, the Cambrian Coast railways and the stations at Oswestry and Welshpool. He learned his trade from his father – a business partner of Brunel – who was a land surveyor throughout a number of Welsh counties. But there was more to Piercy than just engineering; his novel approach led to impressive developments. In 1863, he began a long-term project in cooperation with the Royal Sardinian Railway Company, for planning and renovation of the standard and narrow-gauge lines on the island and the construction of a harbour in the Golfo degli Aranci. Later also in farming, with his own Sardinian property benefiting from the rearing of cattle, horses, and sheep in a manner which was later adopted by many other landholders. 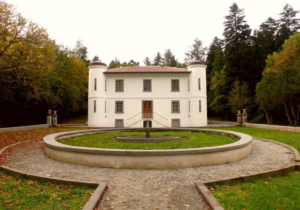 He settled in an area of Sardinia called Badde Salighes where he built Villa Piercy, a building shaped like a four-sided castle, together with a village of forty houses, that accommodated 97 settlers and 210 inhabitants. He became an intimate friend of the great Italian revolutionary Garibaldi, whose son Ricciotti became his pupil. His services to Sardinia were recognised by his appointment as a Commendatore of the Crown of Italy in 1882. Ricciotti later became his assistant in the development of Indian railway lines with the development of the Assam Railway. In 1863, with Savin and the Count of Monthiers, he also won the approval for the construction of France’s Vendee railway from Tours. In his later years Piercy dedicated himself to rejuvenating the railways of his native north Wales. According to the 1908 book, Eminent Welshmen, Piercy was described as someone “from whose surveys and plans nearly every mile of railway in Montgomeryshire and Mid-Wales was made”. and if that weren’t acclaim enough, there’s also an 1800s-board game in honour of his Sardinian legacy! We’re proud to be a British engineering company based in Wales with global reach, striving to build on Benjamin Piercy’s engineering legacy.